John commented on my previous entry he was hoping to find some 4E nuggets here. Well, check it out, an article I wrote previewing magic in 4E Forgotten Realms just went up on D&Di Dragon. The last time I touched the topic of the Democratic candidate, I expressed my preference for many of Ms. Clinton's policies over Obama's. However, I have since become an Obama supporter. Not because I think any less of Clinton. No, it is because I have come to realize several hard realities. One of those realities is that the conservative interests have spent the last 16 years fomenting active dislike (at best!) of Clinton. If Clinton were to become the Democratic candidate, I fear that many of the disenchanted, exhausted voters who might otherwise stay away from the polls will be revitalized, unified in their dislike for Hillary, and show up merely to vote against her. In listening to various radio programs and in polling my own extended conservative family and conservative friends, I am finding this more and more to be true. Another reality, more positive, is that Obama seems to possesses an attraction to many people who have traditionally voted Republican. It could be they haven't had 16 years of negative media saddling their perceptions, and that their unconscious hope to see real change can find a home in a vote for Obama. I've heard Republicans say that they'd vote for Obama over anyone currently vying for the Republican nomination, but if it were Clinton, they'd go with any one of the Republicans (superstition-ridden McCain, or even crazy Huckabee!). Hillary is a fight the right has been preparing for over the last two decades. Let's not give them that battlefront. Jump start a whole new industry of local energy production, complete with all the jobs, salaries, and yes, taxes that pay for services, that would flow from it. Or, give everyone $600 bucks so they can make their car payment for 2 months, or if their car's paid off, buy that new sofa they've been looking at. I vote for investing in a new energy economy! I posted the sad tale of last evening's D&D game on gleemax for those of you interested in hearing how my character, a tiefling warlock named Melech, went toe-to-toe with several black dragons. Our friends Greg and Teresa lent us several movies, one of which was Bridge to Terabithia. We watched Bridge to Terabithia last night. I was expecting a light-hearted fantasy, something along the lines of Harry Potter. In truth, the film was much more difficult. I now discover this film was based on a book of the same name written in 1977 by Katherine Paterson. It is not merely escapist childish fantasy; it is something more akin to a book I was given to read in 6th grade for a school assignment, A Taste of Blackberries. Same hollow feeling at the end, worse probably, with this movie. A good movie, but hard. Sometimes it's good to hear a realistic, straight-talking assessment of where the world stands. The dangers we actually face as peak oil production is reached are perhaps not something you think about a lot, or perhaps have never really thought about. Well, Lester Brown has, and you can hear him talk about his conclusions, and the real problems we're likely to face in the next decade. I found it both alarming and hopeful. A potentially exciting event occurred today--we received signals from intelligent aliens elsewhere in the universe! Though skeptical, Bad Astronomy and Centauri Dreams both discussed it. However, if you read what is apparently the original source of the news, you immediately suspect that some moron reporter misunderstood something but blithely wrote on, hoping to bull through the segment without having to really think about the title and first few lines of the report. And thus it was. It didn't take more than an hour or so to confirm with Seth Shostak, the head of SETI, that the report was bogus. I'm Bruce Cordell, your source of non-news, signing off. UPDATE [Friday 1/18/08]: Apparently, the news source that originally reported the story that aliens were contacting earth blames its readers for the error. I was very happy to notice that the anthology Realms of War got a good review on Amazon. I was also happy to note that my story "Black Arrow" was well received, too. I got my hands on issue number 3 of Kobold Quarterly thanks to the editor's kind indulgence. As I read through the articles this evening, I flashed back to sitting at my friend Bret's house reading the latest Dragon magazines back in the early 80's as a teenager. The great cover combined with the interior's earnest writing and production values remind me of that era. Nostalgia is a powerful force, isn't it? I think this publication might have legs. So it's doubly cool to hear that Kobold Quarterly has decided to come on board early in its support of 4E D&D. Sounds like Wolf's patrons know when to back a winner. Some of you may recall I complained a few months back about pulling a muscle in my back. I've been slowly getting better, with the help of a couple months of physical therapy, which ended in December. I even started getting back on my workout schedule at the end of December. But the muscle knots reached a plateau of healing, then refused to get any better (as in, go away). Early this week I finally got off my duff and sought out a massage therapist specialized in sports medicine. The knots ease up with a tennis ball on a wall--maybe someone who knows what they are doing would work even better? I found Century Massage in Renton. This place isn't about hot stones or scented oils. Its about heavy duty muscle manipulation designed to break up knots. After 30 minutes, I knew I was on to something. I went again this morning, and the numbness I've been feeling in my pointer finger on my right hand since September has finally dissipated. I have a whole new outlook on the year. Here's to avoiding hurting myself in 2008! I recall quite clearly sitting around with my friends in high school, aged 16, trying to imagine the world and ourselves in the year 2000. I would be 32 years old in the year 2000, double my age at the time. I couldn't imagine it. I hoped it would be something fantastic. Perhaps even sci-fi fantastic, like maybe robots would rule the world. But predicting the future is hard, equally hard for 16-year-olds as "psychics." Now it's 8 years beyond even the time horizon I had such a hard time imagining. I've learned a lot in the 24 years that have elapsed since, both about myself, other people, and the wider cosmos around us that stretches on into infinity in every direction. The human species is young, perhaps too young for the "futuristic" powers we're liberating for the use of the mad and compassionate alike. But, I like to think we'll get past these current troubles. Perhaps I'll know if my hope is justified in another 24 years, in the year 2032. Think about all the appliances and equipment you use day in and day out that give off heat. Most notably, your computer. You may hear the fans going, trying to cool it off. If you've got a big LCD TV, you may note it also gives off a lot of heat. And, if you've got an XBOX 360, you've probably learned to open the window if you don't want to cook in the room. I've wished before for some sort of heat-sink that would turn all that waste heat into harvestable electricity. Now, it looks like the nuclear engineer who invented the Super-Soaker is on his way to doing just that: the Johnson Thermoelectric Energy Conversion System, or JTEC for short. Until January 15th, you can download a free PDF copy of my event book When The Sky Falls! When The Sky Falls describes what happens when a fantasy world is struck, and struck hard, by a meteor. The book provides new prestige classes for characters close to ground zero, a variant magic system powered by residual meteor fragments, and many new feats and spells. When the Sky Falls also describes frightening new monsters -- creatures twisted by their proximity to the Afterfall. 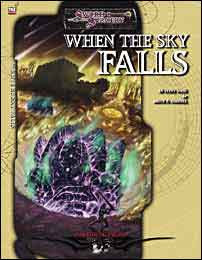 When The Sky Falls was one of the games I wrote with Malhavoc Press (a list that includes Hyperconscious and If Thoughts Could Kill). I remain as proud of it as anything I've done, mainly because it allowed me to stray outside regular fantasy tropes. When things fall from the sky in a fantasy world, they might be nickel-iron, but then again, they might be fragments of something far stranger . . . 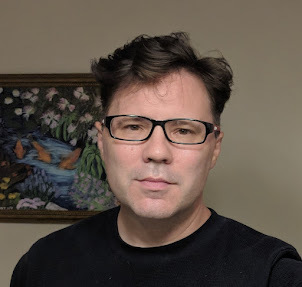 Some of you may have noticed that I disabled anonymous commenting on this blog. That's a pain, I know, but some nutcase calling himself "bruce l" anonymously intimated he'd like to see me and my family dead. Not far shy of a death threat, really. So, no more anonymous commenting. If you are not a member of Blogger, LJ, or some other Blogger approved site, you could get an OpenID and comment here. On the other hand, you may already have an OpenID and not know it. The great thing about OpenID is that it gives you a single digital identity across the internet. So even if you don't want to comment on my blog, you might want to consider OpenID. On the other hand, if it turns out that commenting becomes so much of a pain that no one comments anymore, I may have to reconsider. This incredibly slick little tool at Glassbooth will help you focus on issues, not hairstyles. Try this 2-part quiz, quick and easy, and discover where all the candidates are on the issues that really matter to you. No matter which one of these quizzes I take, it seems like Kucinich is always most representative of my views (94% according to this tool). Sigh. He stands little chance of gaining the democratic nomination, methinks. Of the 2 candidates that seem mostly likely to get the nod, Obama is 78% like me, Clinton 79%. Luckily, my top issue (energy and environment) ranked 'very similar' for both. On the Republican side, the best showing was by McCain who was able to eke out a dismal 51% match with my beliefs, with not a single 'very similar' rating. Giuliani and Romney fare much worse, at 38% and 36%, respectively. As I noted earlier, I've started reading the book Evil Genes: Why Rome Fell, Hitler Rose, Enron Failed, and My Sister Stole My Mother's Boyfriend. So far, it's a fascinating read. There are two ways to get ahead: be the cream, or be the scum. Regardless of which you think you are, you probably share some traits with the other. But not all! To be the 'scum' you have to fully embrace ethics first put on paper by Machiavelli. Try this "Mach" test developed by psychologists to see how closely you resemble Machiavelli's 16th century political screed. Paul Kemp provides the opening scene for his story in Realms of War as a preview. 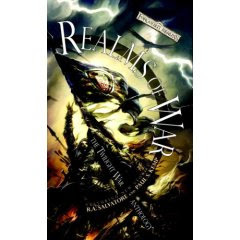 Realms of War is slated for release in on Jan 8th. Following Paul's example, here is the opening piece for Black Arrow, my short story for Realms of War. The letter dates to a conflict that occurred some 300 years before the current timeline in Faerûn, when the nation of Impiltur was reunited by Imphras the Great. My story is about what a young man named Jotharam Feor did in the city of Sarshel before this letter was written. I have heard an account of the Last Battle for Sarshel’s Wall, and of the valor of Jotharam Feor in particular whose deeds proved instrumental in Sarshel’s victory. I regret to inform you your son died bravely in the line of duty. I know how devastating these brutal words must be that bear news of a loss so overwhelming. But know that I and reunited Impiltur itself thank you for your son’s precious service. May Tyr, Torm, and Ilmater assuage the grief of your mourning, leaving only cherished memories of your son. May they grant you solemn dignity and peace in return for your costly sacrifice given unasked, a sacrifice that preserved Sarshel against its enemies, and which may yet conclude the Kingless Years.